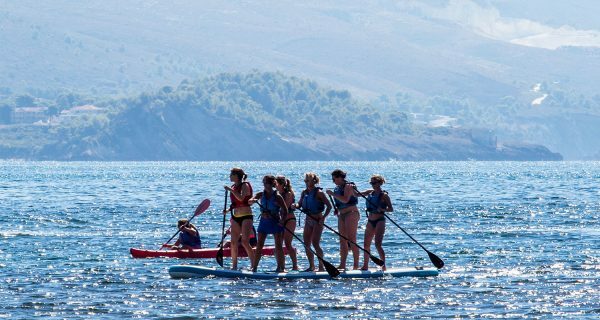 Alongside all the sailing and windsurfing kit, both our Lixouri Bay Beach Club and Paliki Beach Clubs have stand up paddle boards and kayaks for guests to take out. Going for a paddle can be a nice way to spend a couple of hours. Why not visit some of the neighbouring beaches around the clubs? With Kefalonia’s mountainous views and hidden beaches, there is so much to see and explore. First thing in the morning is one of the best times to go for a paddle. Very little wind leaves the sea with a glassy look to it; your board and paddle will be the only things making ripples in the water. Expect these perfect, very low wind conditions early on. Mid to late morning a light southerly breeze fills in, though it can still be lovely to go a casual gentle paddle around our sailing area. Kayaking is really easy to get the hang of. Anyone can grab a boat and head out on to the water. With double kayaks available, this can be a really nice option for getting younger children out on the water. If you’ve not been on a paddleboard before then we would recommend getting some instruction from one of our brilliant water sports team. They can take you through the basics including some handy pointers to get you started, before getting you and your board launched on the water. One of the best things about learning to paddle board in Kefalonia is that if you fall in the water is pretty warm. Whenever the beach is open, we have our water safety team out on patrol. They will keep an eye on your safety but can also provide some useful tips, just in case you’re holding the paddle the wrong way or standing on the board backwards. 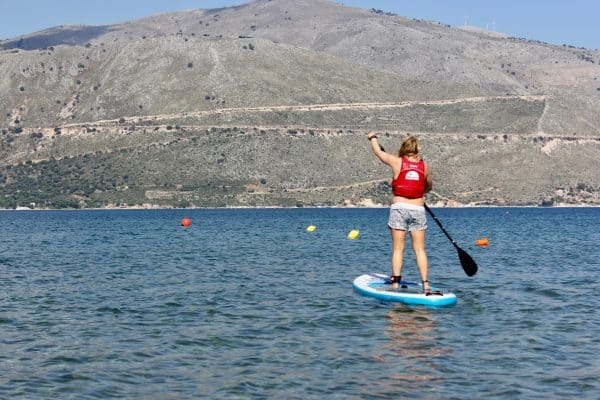 As part of our package at Paliki Beach Club, we offer weekly sup excursions which are run predominately in the mornings when the conditions are calmer. Our instructors will take you on a mornings adventure around the bay. This is great if you have a little bit of experience paddling and would like to explore further around the inlet. It’s a great activity for all the family to take part in, and if there are any little ones who are too small to paddle, they can just sit on the front of the board and enjoy the ride. If paddle boarding is not for you, then you can also join in the excursion in a kayak. From the beach club, You will head down to the local beach of Lepeda where you can grab a refreshing Ice cold Frappe and have a chill on the beach before a casual back to the club. Measuring 17’0 x 5’0, the Red Paddle Co Ride XL is longer and wider than most of our sailing boats. Find a bunch of mates and head out on this inflatable mammoth of a board. It takes a little getting used to, even for an experienced paddler, but with some teamwork, coordination and power paddling this board can really start to shift. With enough room for 10 paddlers, it can also become a bit of a party whilst you’re paddling along. We pride ourselves on having great kit that we keep well maintained. Our kit list is constantly changing as we like to keep it up to date, so feel free to get in touch to ask us for information on specific kit. 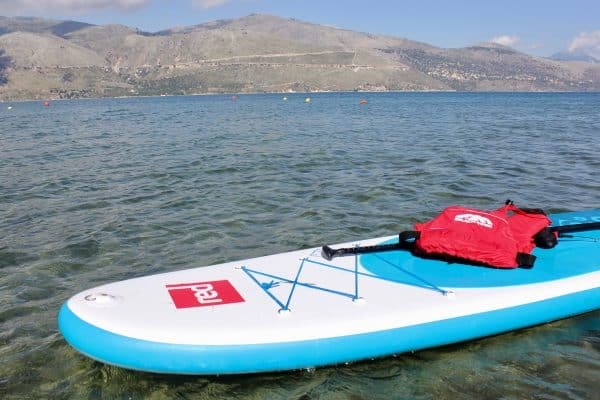 Both clubs have a range of Red Paddle Co inflatable sup boards including a Ride XL at each club. There is also a selection of kayaks too and we have adult and kiddy paddles to suit all heights and ages! Which beach club for paddling? Both beach clubs are great for paddle boarding and kayaking. Both offer easy access to the beach and beautiful views around the bay. Lixouri Bay Beach Club is a really great place for flat water mornings whilst Paliki Beach Club runs the SUP excursions down to Lepeda Beach. Fancy a second week? ….Try a yachting with our Learn to Sail holidays!